View of the Bunker Hill Monument in Charlestown, Massachusetts at sunset just as the blue hour settles in. The day had been dark and overcast until the last remaining minutes when the sun was supposed to be setting. All of a sudden the clouds broke and a few rays of sun escaped, allowing for colorful reflections bouncing off the calm waters of Boston Harbor. 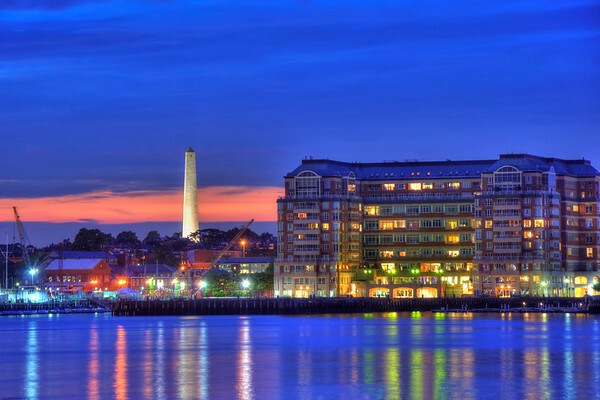 To the right of the monument located in Charlestown Navy Yard, are the luxury condos of Flagship Wharf.